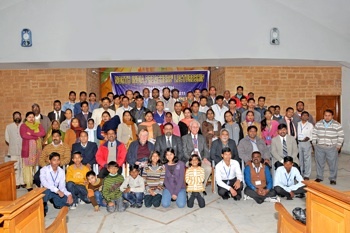 5th North India Preachers’ lectureship Chandigarh and the North India Bible College, graduation ceremony went very well. Prior to the Lectureship we had no fellowship with each other and it seemed as there were no work in the Northern part of India. Again 70+ people from 9 states Delhi, Chandigarh, Punjab, Bihar, UP, MP, Orissa, Maharashtra, and Jharkhand attended this lectureship. 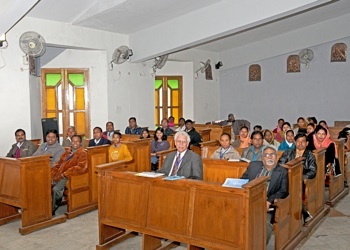 It shows that in the Northern India the Church is very much active and is growing strong. We have graduated 42 people so far who are serving in these states. New works are established across Northern India. Few brothers could not attend this year because of their personal reasons, but overall the lectureship was rejuvenating. It was felt that the brethren now wait for this day each year. It has become an important event for a North Indian Preacher. Few preachers brought their wives also and Sister. Benu took them aside for a women’s fellowship. We had no room for them in the building, we hired, so they gathered in a nearby Park. I believe that a preacher is handicapped without the support of his wife and his wife is equally important for his work. Keeping this in mind we think we should have preachers’ wives’ lectureship in the near future or at least involve them in this great event. The day and the subject for next year are already fixed. 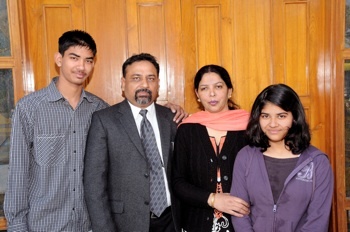 NIPL Chandigarh-2012 will be on Feb. 16 and 17, 2012. And the book of 1 John will be studied. This way we can fix the things in advance as this time because of the late announcement we had trouble in finding suitable place for the lodging. Speakers this time included: Francis David (New Delhi), Amul Bansod (Aurangabad, Maharashtra), Ernest Singh (Agra, UP), Peter Singh (Bilaspur, Chhattisgarh), Julius Hembrom (Bhopal, MP), Vinay David (New Delhi), Russell Bell (Topeka), Bobby Peyton. Brother John O’ Neal could not attend the lectureship because of his ill health. He stayed in Chennai, but was missing this as he is present always. Brother Russell Bell presented 3 different lessons during the lectures and 1 in the graduation ceremony. With the closing of the ceremony we have announced the opening of new session. Students have started coming. 2 from Chhattisgarh have already reached and invitation to other places has also been sent. Apart from this our other efforts to enhance the work are continued. Every preacher of the Lord’s church is deeply involved in this great effort. Gandhi once said that India lives in Villages, and it is very much true. The real India lives in villages. Before graduation we took students to brother Salatial’s place, 250 kms. from here. It is near the Pakistan international Border. They visited houses and the villages, arranged a gospel meeting where I Preached. They enjoyed in the village ministry. Met people, prayed with them and taught them. It is our daily routine to go to people and share with them the word of God. On Mondays Benu has ladies’ class in our home, on Wednesday we have Bible study. Each month on the first Wednesday we invite people and preachers from the state to have fellowship and share their experience as they labor for the Lord. Sending a daily Bible verse was started in November last year with 200 SMS and has touched 1,000 marks in just a few months. This service was started keeping in view the people of unbelieving India. We thought to send each day one verse’ related to people and that way they will be allowed to know about the Bible. We get telephone calls from all over India. Some are interested in Bible study; some ask for prayer, some forward that massage and some give more contacts to reach the unreached. It has been a real blessing that we have been instrumental in feeding this much people are fed by the word of God daily. Recently we have started a new service called BIBLE KI BAAT (Let the Bible Say). In this service a brief, personal letter is planned to print with a Bible topic on an inland letter. This is cheaper than the regular letter. We send an inland letter and fix postal stamps on it and send each month to various people. This way we can send 12 different articles a year. In the first step, we have already sent 1,000 letters in January and are planning to print 3,000 more. Presently we have 4,000 addresses in our list, nationwide. Understanding that we can reach more souls by this kind of tiny, simple and easy to digest weapon in lesser time. we want to fill the people’s mind with Apostles’ Doctrine. A letter would cost us Rs. 6 (approx $0.14). For 4,000 letters at least we will need $600 each month. We want to involve people in that and ask your prayer for this ministry. We had translated and printed why I am a Member of the Church of Christ (Leroy Brownlow) and Some Things you Should Know in Hindi, Things Eternally Important (Charles F. Scott), Understanding New Testament Christianity (Charles F. Scott), 10 Simple Rules to Understand the Bible (Charles F. Scott) and Bridge of Life in Hindi and Punjabi languages. All these are helpful for the brothers in their evangelism work. We helped preachers with the Bibles, song books and these booklets, and the Truth for Today literature as well. Again this year 25,000 Hindi copies, and 3,000 Punjabi copies of the Indian version of Becoming a faithful Christ were distributed throughout India. Brother Peter Singh from Bilaspur (Chhattisgarh) telephoned that he needs 500 more copies of Understanding New Testament Christianity. We have English and Hindi video lessons from the WVBS. We show to the regular students. We have encouraged the local people to learn that but sometimes they discontinue after some time. I plan to offer them certificate of participation once they complete the course. Hopefully this will work well. We had started that a few years ago with an old TV. This TV is not working well. Sometimes the picture comes and sometimes the audio. We need a good TV with big screen where about 20 people can sit together and watch the classes. Please Pray for that. Requests for Bibles, tracts from the brothers are received as they know that we help with this material. We get requests for the Bible correspondence course in Hindi language as well printed more that 5,000 request cards and sent to different people. The names of those who respond are forwarded to the local Church of Christ preachers for follow up. Voice of Truth International (Hindi) is proposed to start. Earnest Gill and familyPlease pray that the Lord may provide a permanent place to operate these good works for His glory. We are facing problem where we have class rooms as well as with our living quarters. People have difficulty that we use residential accommodation for the church activities and our house owner wants us to vacate after February 28th. It is matter of real concern for us as we lose peace of mind with this kind of obstacles. It hurts Lord’s work. Posted on February 27, 2011 by Bob Turner.